Amazons, I love garlic. I mean… I LOOOOOOVE garlic! It is brilliant! And depending on how it’s prepared, it can take on numerous flavor characteristics. One of my favorites is simple roasted garlic. Roasting really takes the bite out of fresh garlic and brings out its sweet side. It’s so easy, I could kick myself for not doing it more often! And I thought to myself, “how can my Amazons use their new garlicky skill?” Surely, having done your research on this paleo/Whole30 thing, you’ve heard about faux mashed potatoes made from cauliflower. And I know we’ve only just had a chat about cauliflower, but I think it’s worth it to bring it up again. So, I’m going to outline a simple cauliflower purée into which you can incorporate the garlic. Raw garlic. Not ideal because of the green shoots, which make garlic a bit bitter, but still roast-able. 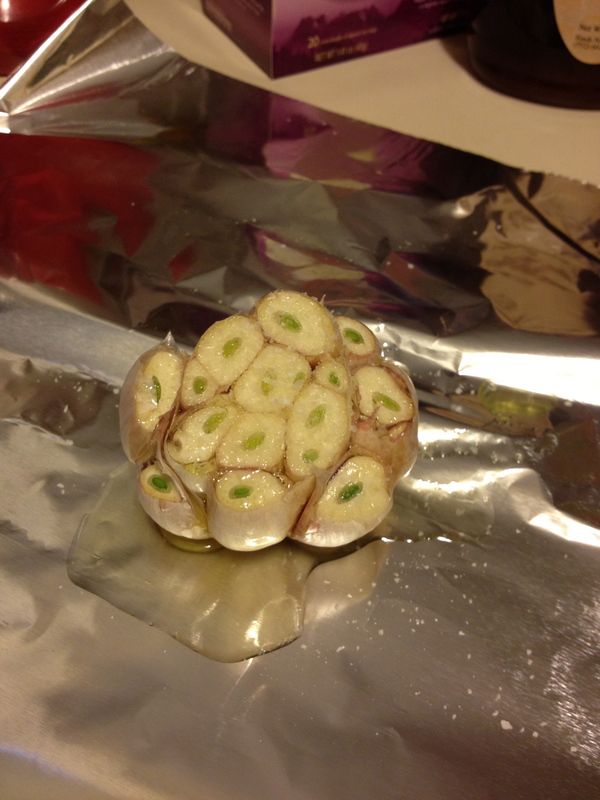 Chop off the top of the head of garlic, exposing the cloves within. Remove any excess papery skin. Place on sheet of foil, drizzle with olive oil, sprinkle with salt, close the foil loosely around the head and place in the oven for 30-40 minutes. Done! ProTip: To remove the stinky, garlicky smell from your hands after handling fresh garlic, wash your hands with soap and water, and presuming you have a steel faucet, rub your hands on the steel faucet in the process. The steel will break the chemical bond that makes that garlic smell stick to your skin. tablespoons of butter, salt and pepper, and 5 cloves of the roasted garlic. 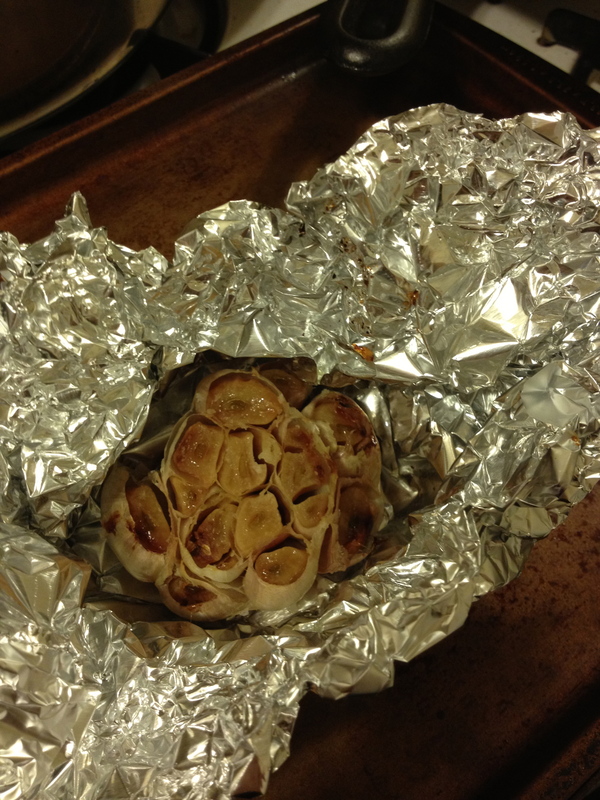 The roasted garlic will pop right out of the head when squeezed slightly. Keep tasting and adjusting the seasonings as necessary. You could use white pepper to maintain a perfectly white purée, but I rather like seeing the flecks of freshly ground black pepper. I have to tell you, after making this for myself, I don’t know that I’ll ever make mashed potatoes again. The benefits are too great. It’s easier. 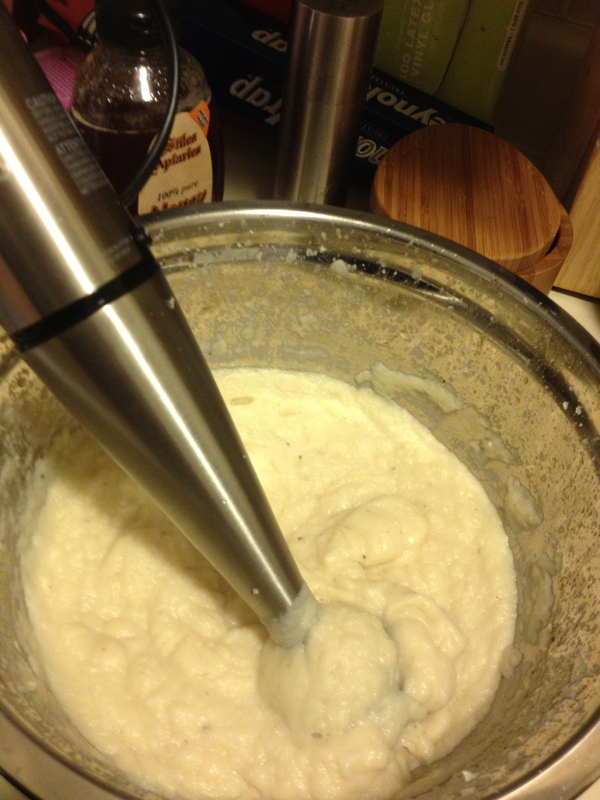 You can’t over whip or mash cauliflower (over agitating potatoes can make them gluey). They’re lower in calories (which means I can add more butter and whatnot). And they’re so much more nutrient dense! 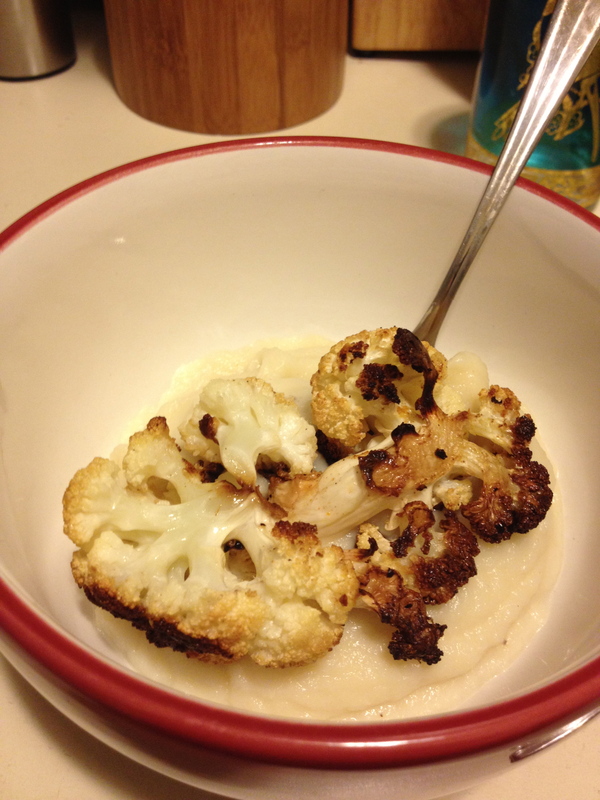 Purée topped with roasted cauliflower florets. Sorry today’s post was a little late, my beloved Amazons. Time got away from me this week. But I hope you enjoy this dish and can put it to good use! As always, if you have questions, thoughts, or wisdom to share, please hit us up in the comments section. Or if you’re interested in an in-home kitchen day with the Amazons in NYC, email me at EATS@urbanamazon.net. Totally random Amazon side note: Anne came over last night with a bit of this batch as a side dish for our dinner. It was freakin’ delicious! Whole-hearted testimonial. Love it.